The house is wearing a pin stripe suit! 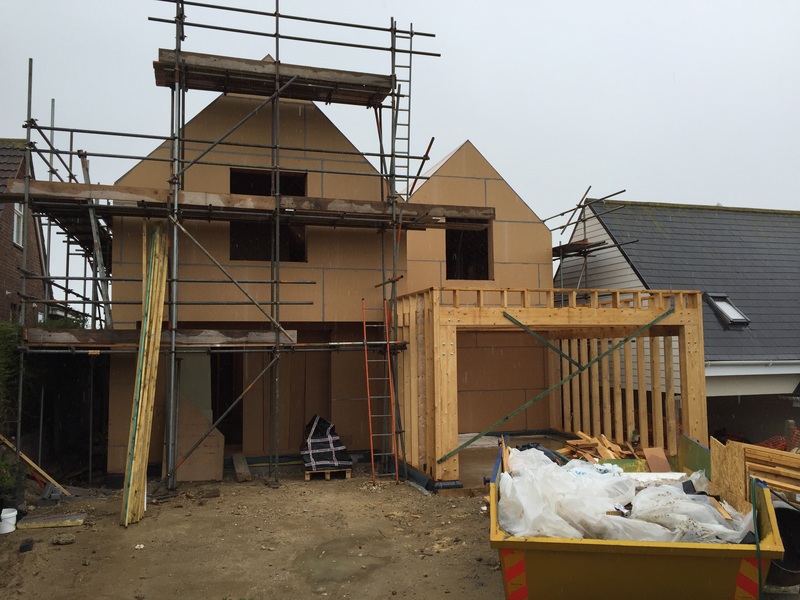 The last two weeks have unfortunately brought a considerable amount of rain and high winds, hindering progress on site. 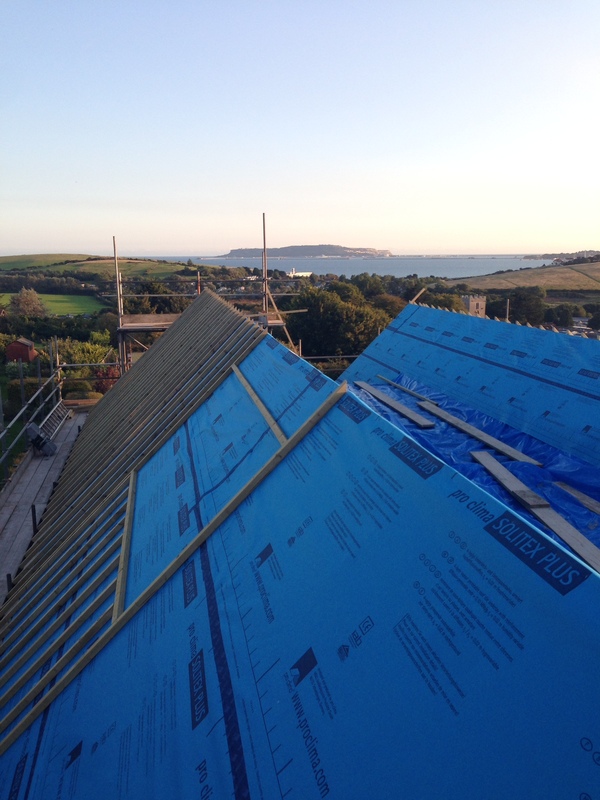 With the forecast showing a break in the weather Tom has started installing the membranes and battens to the roof. 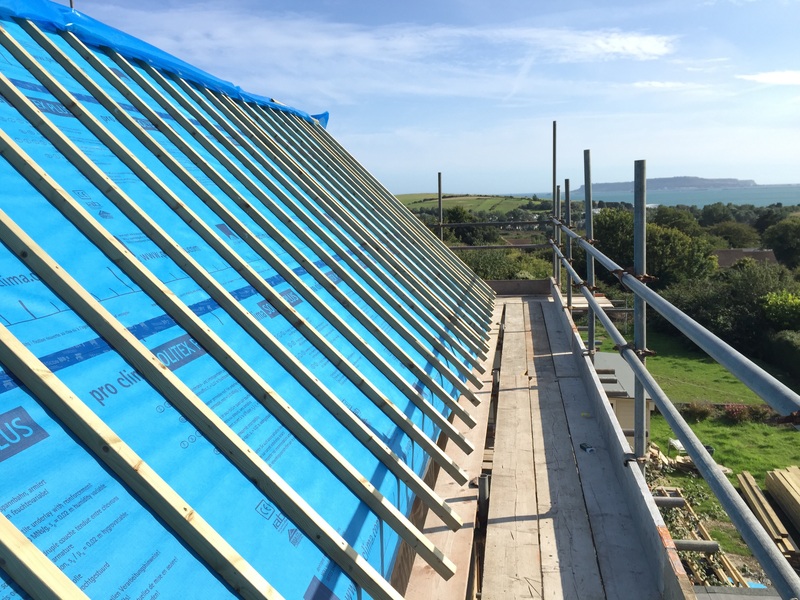 The Pro Clima Solitex Plus membrane (blue) for the roof provides superior protection against condensation risk and extreme resistance against driving rain. It is an ‘active moisture transport’. 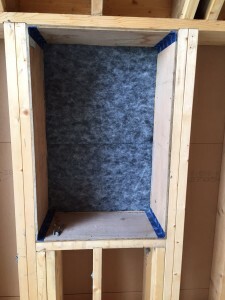 The manufacturer says ‘The closed cell technology unique to Solitex Plus ensures that it has the best combination of extreme water-resistance, high breathability and outstanding physical strength. 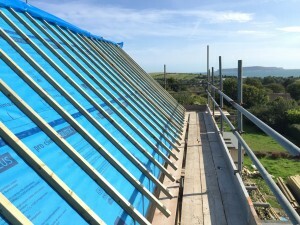 Unlike conventional breather membranes which utilise a micro-porous membrane, Solitex Plus employs a revolutionary closed cell vapour-permeable film which provides weather tightness and at the same time, ensures that a significant amount of water vapour is actively removed from the inside of the building structure and diffused to the exterior. 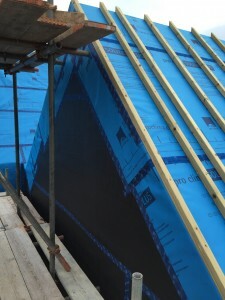 The roof membranes are lapped and taped using Tescon Vana Tapes. 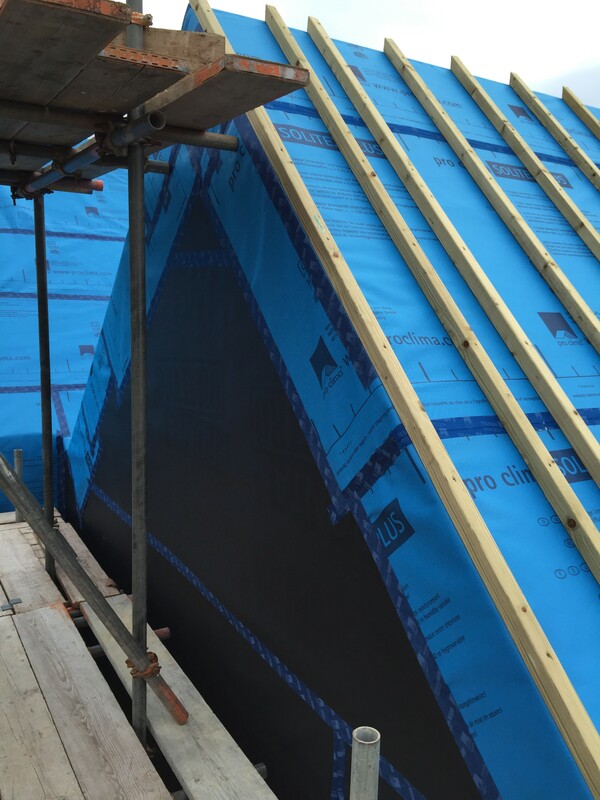 The 50×50 treated roof battens are screwed back through the 16mm airtight board to the timber rafters using 6.0 x 100mm stainless steel screws at 400 centres. We are using the Pro Clima Solitex Quattro membrane (black) for the walls which are also lapped and taped using the Tescon Vana Tapes. The battens create a very important continuous venting air gap behind the render to the walls. 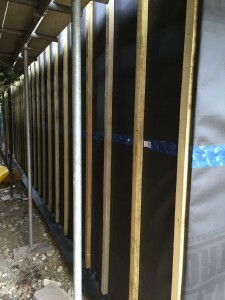 The air gap behind any battened cladding must be a minimum of 25mm and not bridged. 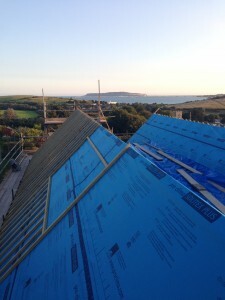 We have allowed for a 38mm continous to the walls and 50mm for the roof. 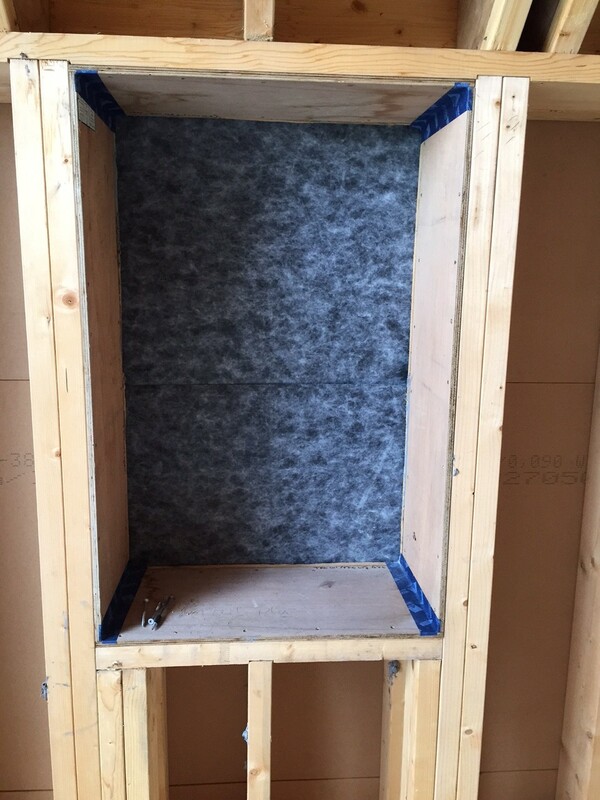 At the base of the walls we will provide an insect mesh. With the timber frame complete and the airtight layer installed, its a race to get watertight. 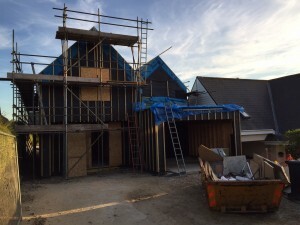 The membranes, battens, cladding, roof and windows all have to be installed over the next two months before the October storms and rain arrive.